Oh the fun and flavor you can enjoy with Logic Smoke Peanut Butter flavored electronic cigarette e-liquid! 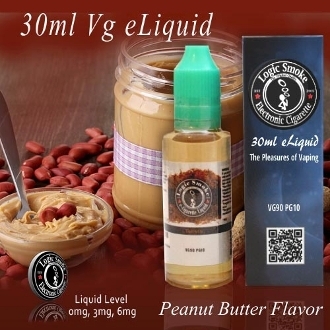 The yummy flavor of this natural tasting peanut butter e-liquid is not too sweet, just right for vaping it alone or to mix with a variety of other Logic Smoke flavors, made specifically for your MOD unit. You can really get creative with this one! Mix with Chocolate Cream and Banana for the taste of a creamy chocolate-peanut butter-banana milkshake. Mix with white chocolate to have your favorite chocolate-peanut butter candy treat. Mix with the Waffle flavored e-liquid with just a touch of grape for a peanut butter and jelly sandwich! Let you imagination go wild on peanut butter!